Seejay Racing LLC’s Spelling Again, third in the one-mile Ruffian (Grade II) at Belmont Park two weeks ago, will cut back in distance in an attempt to land her third stakes win at Churchill Downs when she goes to post in Saturday’s 13th running of the $100,000 Winning Colors (GIII). A competitive field of seven fillies and mares were entered Wednesday for the annual Memorial Day weekend six-furlong sprint. The Winning Colors, which honors the Hall of Fame filly that prevailed against colts in the 1988 Kentucky Derby, is one of two stakes events on Saturday’s 11-race program. Churchill Downs’ first race is 12:45 p.m. (all times Eastern). The Winning Colors goes as Race 10 at approximately 5:21 p.m. and the fourth running of the $65,000-added Keertana Overnight Stakes, a 1 ½-mile grass marathon for fillies and mares, is the sixth race at approximately 3:15 p.m.
Spelling Again, conditioned by Louisville native Brad Cox, is one of four stakes winners entered in the Winning Colors and tops the field with earnings of $357,456 from five wins, three seconds and fourth thirds in 18 career starts. She remained unbeaten in two starts at Churchill Downs after cruising to a 4 ½-length win over Ahh Chocolate in November’s $200,000 Chilukki (GII). Last September, she also won the $100,000 Open Mind over six furlongs. The 5-year-old Pennsylvania-bred daughter of Awesome Again would be making her third start of the year in the Winning Colors. Spelling Again finished seventh at 36-1 in the Madison (GI) at Keeneland over seven furlongs – Sheer Drama, Stopchargingmaria and Wavell Avenue ran one-two-three – and was beaten 7 ¼ lengths five weeks later in the May 14 Ruffian by five-length winner Cavorting and runner-up favorite Carrumba. Spelling Again landed post six for Saturday’s return to softer competition over her home track and will be reunited with jockey Shaun Bridgmohan, who was aboard for her two stakes triumphs. The Winning Colors field from the rail out (with jockeys and assigned weight): Fioretti (Sophie Doyle, 122), Wrath of Ruthie (Ricardo Santana Jr., 120), Diva Express (Julien Leparoux, 120), I’m a Looker (Robby Albarado, 120), Enchanting Lady (Florent Geroux, 120), Spelling Again (Bridgmohan, 120) and Super Saks (Channing Hill, 122). Spelling Again, who has performed at her best while running close to the pace, will likely be chasing the speedy Super Saks in the early stages of the race. Trained by legendary Hall of Famer D. Wayne Lukas, Robert C. Baker and William L. Mack’s Super Saks has won a pair of six-furlong stakes in gate-to-wire fashion in the last six months. 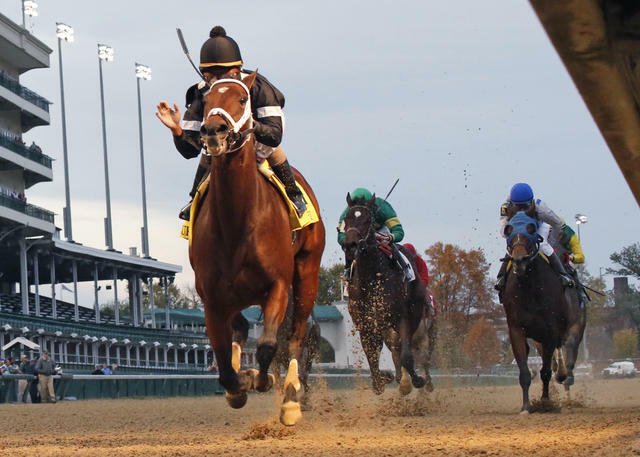 The 4-year-old Sky Mesa filly won the $83,124 Dream Supreme Overnight Stakes in November to remain unbeaten in two starts at Churchill Downs, and reigned supreme in the $150,000 Carousel at Oaklawn Park on April 14. She finished seventh of nine last time out in the Humana Distaff (GI) on the Kentucky Derby undercard after a rough start and checking near the five-sixteenths pole. The other two stakes winners in the field are Two Hearts Farm LLC and Don Janes’ 6-year-old mare Fioretti, upset winner of last June’s Roxelana at Churchill Downs and October’s Thoroughbred Club of America (GII) at Keeneland, and Kaleem Shah Inc.’s Enchanting Lady, who won the 2014 Landaluce and 2015 Santa Paula at Santa Anita. Enchanting Lady, prepared by Hall of Fame trainer Bob Baffert, was third behind Taris and Stonetastic in the Humana Distaff after bobbling and being bumped at the start by Super Saks. John C. Oxley’s Diva Express and Glenmare Farm LLC’s Grade II-placed I’m a Looker reengage after a head separated the two in a swift second-level, six-furlong allowance on May 3 that was clocked in 1:08.85 – the second fastest of 25 races at the distance this meet only behind W. B. Smudge’s 1:08.64 on May 19. Meanwhile, LNJ Foxwoods’ Wrath of Ruthie looks to regain the form she displayed for trainer Steve Asmussen in her first two career starts at Churchill Downs, which were won by a combined 17 lengths. In the Keertana, Ken and Sarah Ramsey’s 5-year-old mare Al’s Gal will attempt to avenge a troubled trip in the April 29 Bewitch (GIII) at Keeneland that resulted in a half-length loss to multiple stakes winner Olorda (GER). Trainer Mike Maker has given the riding assignment on the Pennsylvania-bred daughter of English Channel to Florent Geroux, who began the week with 44 wins and earnings of $1,961,839 on turf in 2016, which rank second and fourth, respectively, in North America. The Keertana field from the rail out (with jockeys): Al’s Gal (Geroux), Tiz Kismet (Leparoux), Salama (Corey Lanerie), Sakonnet Point (Jack Gilligan), Sequiota (Fernando De La Cruz), Street of Gold (Albarado), Annulment (Gary Stevens) and Weekend Wish (Brian Hernandez Jr.). All starters will carry 121 pounds. Saturday’s card also features a second-level allowance for 3-year-old fillies that includes a pair of participants in this year’s Longines Kentucky Oaks (GI): Stoneway Farm’s eighth-place finisher and Fair Grounds Oaks (GII) runner-up Dream Dance; and Winchell Thoroughbreds LLC’s Taxable, who was 14th after finishing second in the Fantasy (GIII) at Oaklawn Park. The 1 1/16-mile allowance goes as Race 8 at 4:19 p.m.
Churchill Downs admission gates will open Saturday at 11:30 a.m. General Admission is $3, reserved seating is $10 and reserved dining packages are $38. Tickets can be purchased in advance online at ChurchillDowns.com/Tickets. With Memorial Day on Monday, Churchill Downs will have a special five-day holiday week of racing (with first race post time, number of races): Thursday (5 p.m., 8 races), Friday (12:45 p.m., 9 races), Saturday (12:45 p.m., 11 races), Sunday (12:45 p.m., 10 races) and Memorial Day Monday (12:45 p.m., 11 races). The Twilight Thursday abbreviated eight-race program is highlighted by $1 draft beers, food trucks, live music by 80s cover band Radiotronic and a Wagering 101 tent for betting advice. There also is a $412,802 jackpot carryover for the 20-cent minimum Single 6 Jackpot on Races 3-8. The “Who’s the Champ? Handicapping Contest” returns Sunday. Interested participants can enter for $35 ($30 for TSC Elite members) for a chance to win the $1,000 cash voucher first prize by placing mythical $2 win and place bets on Races 3-8. Second place receives a $500 voucher and third place is worth a $200 voucher. Registration takes place between 11:30 a.m. and 1:30 p.m. on the Clubhouse second floor at the top of the Gate 17 escalators. In celebration of Memorial Day on Monday, all active and retired members of the United States armed forces will be admitted free of charge or receive a discounted ticket to dine on Millionaires Row. Also, Churchill Downs’ bugler Steve Buttleman will perform patriotic melodies following the “Call to the Post” for each race. For more information visit ChurchillDowns.com. Churchill Downs Leaders Through 14 Days of 38-Day Spring Meet (Races Won) – Jockeys: Corey Lanerie (21), Julien Leparoux (21), Robby Albarado (13), Florent Geroux (13), Brian Hernandez Jr. (12), Jon Court (6), Gary Stevens (6), Ricardo Santana Jr. (5), Francisco Torres (5) and Shaun Bridgmohan (4) … Trainers: Mark Casse (11), Mike Maker (8), Chris Richard (7), Dale Romans (6), Steve Asmussen (5), Bret Calhoun (5), Chris Hartman (5), Kenny McPeek (5), Al Stall Jr. (5) and “Buff” Bradley (4) … Owners: Richard and Karen Papiese’s Midwest Thoroughbreds (5), Ken and Sarah Ramsey (5), Ernie Semersky and Dory Newell’s Conquest Stables LLC (4), John C. Oxley (4), Sherri McPeek’s Magdalena Racing (3) and Maggi Moss (3) … Horses: Bullards Alley (2) and High Heeled Girl (2).